Vedantu.com - No.1 online tutoring company in India provides you the Free PDF download of NCERT Solutions for Class 9 Science (Biology) Chapter 7 - Diversity in Living Organisms solved by Expert Teachers as per NCERT (CBSE) Book guidelines. All Chapter 7 - Diversity in Living Organisms Exercise Questions with Solutions to help you to revise complete Syllabus and Score More marks. Register for our free webinar class with best Science tutor in India. Unit II The Fundamental Unit of Life, NCERT Grade 9 Chapter 7, Diversity in Living Organisms, plunges the importance of relevant groups to study the importance of life forms. In this chapter, the student will learn about the broad groups of organisms. The solutions given to the questions asked in between the chapter and at the end of the chapter will provide further clarity to the learner about the chapter. The solutions given for the topic what is the Basis of Classification? and classification and evolution is explained through detailed content about the hierarchical classification. The hierarchy of classification- groups including Monera, Protista, Fungi, plantae and Animalia are some of the topics associated to classification in this chapter. The solutions provided for all these topics will help the learners to understand about the detailed view of the five kingdom classification.Nomenclature of Carbon compounds describes well about the different methods used to name a carbon compound. The solutions given to the questions asked related to these topics help in further reinforcement of the concepts.The topic Plantae including Thallophyta, Bryophyta, Pteridophyta, Gymnosperms, Angiosperms will be taught in this chapter. All these topics have been taught with the help of precise information and well explanatory diagrams.The solutions given for the exercises for these topic will further help the learner to achieve a clear viewpoint about the chapter. Similarly, as one proceeds further through chapter 7, topics such as Animalia including Porifera, Coelenterata(Cnidaria), Platyhelminthes, Nematoda, Annelida, Arthropoda, Mollusca, Echinodermata, Protochordata, Vertebrata will be learnt. The solutions to all the practice questions based on these topics will help the student to understand and correlate in a better way. The topic nomenclature describes the need of systematic naming of living organisms.Solution to practice exercises based on the mentioned concepts are also given in this chapter that will provide an overview of the complete chapter bringing the key ideas into a clear perspective.This chapter is a part of Unit II The Fundamental Unit of Life. Unit II holds 20 marks of weightage in the final examination of Grade 9 according to the latest pattern. 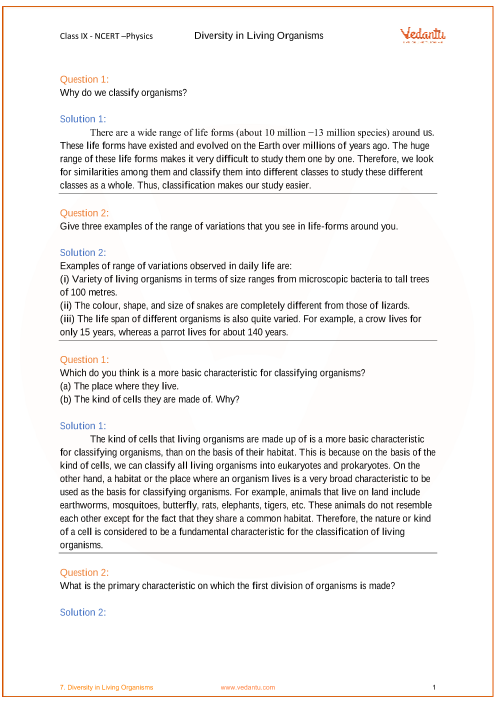 Get 100 percent accurate NCERT Solutions for Class 9 Science Chapter 7 (Diversity in Living Organisms) explained by expert Science teachers. We provide solutions for the questions given in Class 9 Science textbook as per CBSE Board guidelines from the latest NCERT book for Class 9 Science. The topics and sub-topics in Chapter 7 Diversity in Living Organisms are given below. Ex 7.1 - What is the Basis of Classification? EXERCISE 7.7 - 6 Questions with Solutions. Other than given exercises, you should also practice all the solved examples given in the book to clear your concepts on Diversity in Living Organisms. Download the free PDF of Chapter 7 Diversity in Living Organisms and take the print out to keep it handy for your exam preparation.